In the past, bike rims were usually made of steel, then later of stainless steel. They were really heavy and did not provide good stability and durability either. Eventually, the first aluminium rims were created, and the currently in-use stable hollow section rims were derived from those. The current hollow section rims are produced with high quality, suitable for also demanding purposes, and have proved themselves to be stable as well as durable. The manufacturers achieve the required stability thanks to various amounts of holes in the spoke drillings. 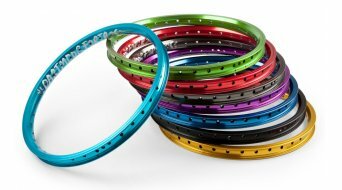 For MTB rims for example, there are 28-hole, 32-hole, and 36-hole drillings in the rim for the spokes. The rim width too affects the stability of the wheel and accordingly the off-road capability of your bike. For road bikes, a V rim is used most of the time. A rim for road bike is trim and especially streamlined, offering aerodynamic advantages which are highly valued by road bikers. Rims for road bikes also have less spokes than those for mountain bikes. In the high-end range, carbon is very often used as material. Carbon rims provide even better aerodynamic advantages most of the time, and are the right choice for bikers who value weight optimisation.